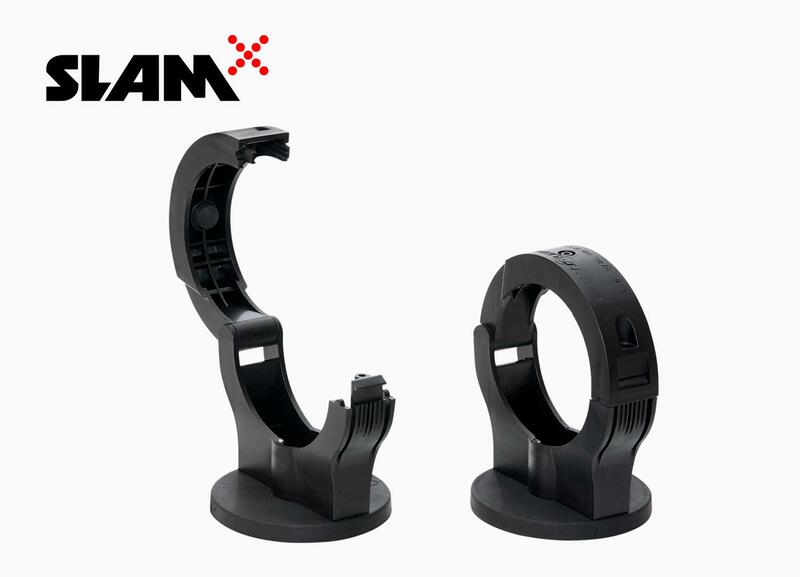 SLAM® Click’n Fix is the easiest fixing system for portable Ex lighting solutions. No lighting system is complete without Ex certified brackets and fixings to ensure every part of the lighting system remains safe to use. You can find Atexor SLAM® brackets which suit most surfaces, even on uneven. We design the brackets for durability and ease-of-use. The Atexor SLAM® Magnetic Bracket is a strong, fully dissipate magnetic fixing option that does not require separate bonding wires! These brackets also come in handy for cable and wiring control – just loop them through a couple of brackets to get that mess off the floor! We also have also added some extra flexibility in the bracket design to help you with those tricky metal surfaces like corrugated steel. The magnetic bracket comes in two versions: a bracket that is firmly connected to the magnet and a floating bracket. The floating bracket allows the magnet to adjust to uneven surfaces and attach in different horizontal or vertical directions, like on smaller tank walls inside larger tanks. Sometimes magnets are just not an option. If you need a way to install Ex work lights on surfaces made of wood or concrete, for example, the Atexor SLAM® Single Bracket is for you. This Ex certified Single Bracket solution allows you to firmly attached brackets to surfaces with sturdy screws. Once the bracket is installed, you can easily attach and remove your SLAM® work lights. The Atexor SLAM® Scaffold Bracket is ideally suited to painting jobs and similar work where scaffolding is setup in an Explosion Hazardous Area. This dissipative bracket includes a pipe connector with sharp teeth for gripping and a convenient tightening strap for fast mounting. We created the Atexor SLAM® Unistrut Bracket as a bespoke fixing option for industries where Unistrut® tracks are used. The bracket is specifically designed for headache-free installation on Unistrut tracks. If you are working in an Ex area that has pipes and scaffolds, an easy way to install temporary Ex luminaires is with S-hooks. We put together the Atexor SLAM® S-Hook Bracket solution to make hanging Ex luminaires exceptionally fast and easy. The solution includes brackets with loops for the work lights and our Ex certified S-hook system. This is without a doubt the perfect solution for maximum installation speed and convenience. Use Atexor SLAM® S-Hooks to quickly and easily hang up SLAM® Ex luminaires. The hooks are covered with soft rubber and are fully dissipative. As with all Atexor products, we have tested and verified that our S-hooks are completely safe to use in Explosion Hazardous Areas. One kit includes two hooks. You can count on Atexor SLAM® Hanging Straps anywhere you go. They are flexible and extremely lightweight. You can easily adjust the straps to fit your work site requirements such as pipes, masts and supports of various dimensions. SLAM® Hanging Straps are considerably easier to attach and remove after a job is done than conventional ties.